In Chicago, we are extremely fortunate to have the World&apos;s Only Outdoor LGBTQ History Museum. 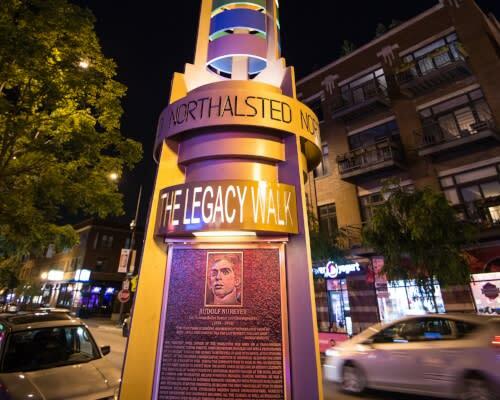 Located in the heart of the Lakeview neighborhood, the award-winning Legacy Walk, spans a half mile of the North Halsted corridor, stretching from Belmont Avenue to Grace Street. The walk currently features 37 bronze memorial markers. Each of these distinguished plaques commemorates either an LGBTQ hero or heroine from history or a significant LGBTQ historical event. 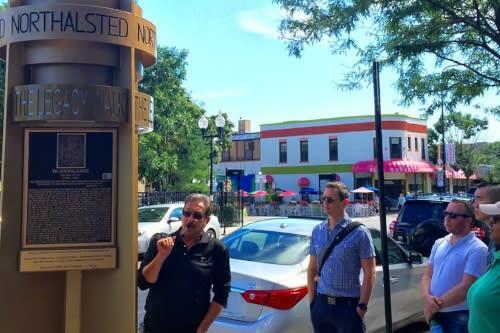 The plaques are affixed to the 20 steel Rainbow Pylons which dominate the streetscape and designating the area as the center of LGBTQ Chicago and making it the only architecturally-defined LGBTQ neighborhood on earth. The Legacy Walk is a history and education project dedicated to celebrating the importance of LGBTQ contributions to society in an effort to foster pride and promote acceptance. The first dedication of plaques occurred on October 11th, 2012 (National Coming Out Day) and additional plaques have been added annually around this significant LGBTQ date. As of 2017, three spots remain open on the North Halsted streetscape and one of those spaces, currently under contract, will celebrate the LGBTQ cultural and artistic importance of The Harlem Renaissance. A full Legacy Walk tour offers a fascinating glimpse into LGBT history. Total elapsed time for the full tour without stops is approximately 3.5 hours. If you don’t have time to enjoy the entire Legacy Walk, options are available. The Legacy Walk Map is divided into three geographical zones – Red, Blue, and Purple – to limit the amount of walking you will do. Each zone of the tour lasts about 75 minutes. To tailor the experience to your group’s interest, a “Custom Tour” of individuals is also available. Salvo will construct a tour covering exactly whom you select. Nine to twelve bronze markers can be viewed in an hour, depending on questions from the group. Legacy Walk guided tours are reasonably priced and in some instances, free. Middle and High School Students may take the tour at no charge. College Students and Seniors are charged $10 dollars a person, and general adults tickets are $25. Discounts are offered to returning groups who prefer to do the tour in segments. Tours are available seven days a week and can be combined with breakfast, lunch, dinner, cocktails, or even shopping. Salvo adds that folks come away from the tour with compliments that it was both educational and entertaining. When asked for recommended eateries along the route, Salvo maintains there is no shortage and mentioned: Lark (3441 North Halsted Street), Las Mananitas (3523 North Halsted Street), Forever Yogurt (3510 North Halsted Street), Yefseis Cafe (3344 North Halsted Street), and Drew’s on Halsted (3201 North Halsted Street). For a cocktail, Salvo chose the legendary video bar and entertainment center Sidetrack (3349 North Halsted Street) and the craft cocktail specialists Elixir Lounge (3452 N. Halsted). The plaques currently on display are The Pink Triangle, Alan Turing, Josephine Baker, Jane Addams, Dr. Sally Ride, Bayard Rustin, Dr. Alfred Kinsey, Cole Porter, Frank Kameny, Leonard Bernstein, Frida Kahlo, Fr. Mychal Judge, Dr. Tom Waddell, Harvey Milk, Barbara Jordan, Vito Russo, Sylvia Rivera, Daivd Kato, Lorraine Hansberry, Dra. Antonia Pantoja, Reinaldo Arenas, Alvin Ailey, Ruth Ellis, Audre Lorde, Oscar Wilde, Babe Didrikson, Leonard Matlovich, Dr. Margaret Chung, Walt Whitman, Keith Haring, James Baldwin, Christine Jorgensen, Billy Strayhorn, Two Spirit People, Barbara Gittings, Rudolf Nureyev, and the Stonewall Riot.